Phan Thi Kim Phuc was born and raised in the village of Trang Bang, 30 minutes north of Saigon. During the Vietnam War, the strategic Route 1 that runs through the village became the main supply road between Saigon and Phnom Penh. On June 8, 1972, an American military advisor coordinated the napalm bombing of Kim’s village by the South Vietnamese. Nine-year-old Kim fled from a pagoda, where she and her family had been hiding. Two of her infant cousins did not survive the attack, and Kim was badly burned. Kim was photographed running down the road, screaming from the burns to her skin. Nick Ut, the Associated Press photographer who was there to cover the siege, took the photograph of young Kim. Moved by her pain, he rushed her to a South Vietnamese hospital. She then spent 14 months recovering in Barsky Hospital, the American hospital in Saigon, where her care was paid for by a private Foundation. Ut’s photograph of Kim remains one of the most unforgettable images of the Vietnam War. Kim Phuc was not expected to live. Third degree burns covered half of her body, and she would require many operations and years of therapy. After two years, against all odds and with the help of doctors who were committed to her care, she was able to return to her village, where she and her family began to rebuild their lives. In 1982, 10 years after the famous photograph was taken, a German photographer located Kim. In the interim, the Vietnamese Government had subjected her to endless interviews, communist officials had summoned her to Ho Chi Minh City to be used in propaganda films, and Kim had been forced to leave school and move back to her province where, as a “national symbol of war”, she was supervised daily. In 1986, Kim seized the opportunity to study in Cuba, but once again her studies were cut short. She was beset with physical problems, including diabetes, which blurred her vision. While in Cuba, she met a fellow Vietnamese student, Bui Huy Toan. They married in 1992, and spent their honeymoon in Moscow. Returning to Cuba, the couple defected when their plane stopped to refuel in Gander, Newfoundland. They settled in Canada with the help of some Quakers. Her husband, a computer specialist, was able to find employment as a nurse’s aid working with the disabled. In 1996, the Vietnam Veterans Memorial Fund invited Kim to attend the Veterans Day ceremonies at the Vietnam Memorial in Washington, D.C. Kim spoke to a group of several thousand Vietnam War veterans about her experiences after the napalm attack on her village. She used that opportunity to share with the verterans about how she finally found happiness and freedom after years of pain and suffering; she spoke about pain and suffering. She even met a pilot who coordinated the air strike on her village – she forgave him! 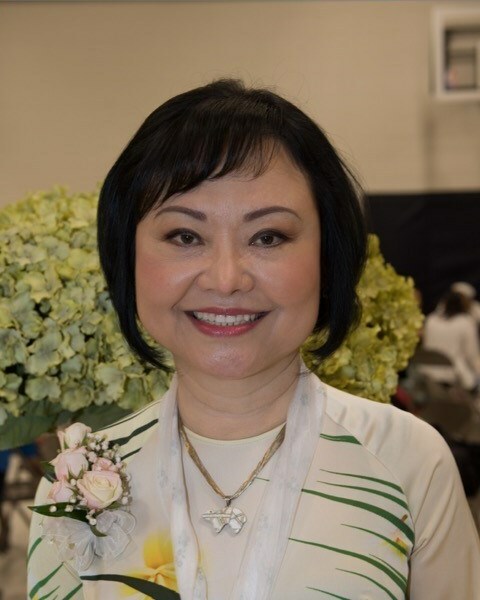 Now Mrs. Kim Phuc lives in the Toronto area of Canada with her husband and two sons, Thomas and Stephen.